There’s a small triangular shaped area located between the Far East Field and the property corner. In the 1930’s this was farmed along with the larger field. 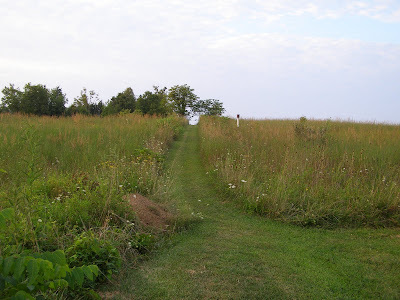 Because of its steeper slope, this area developed severe erosion gullies and was eventually left unfarmed. I estimate that it was allowed to revert to grass around 1960, so it has had about 20 more years than the Far East Field to revert to native vegetation. This makes it the oldest shale based soil area at Blue Jay Barrens and I use it as an indicator of what I can expect in the rest of the open shale areas. There are about three separate openings separated by clumps of trees. The openings were pretty much full of medium sized cedars before I cleared it out 20 years ago. Fortunately, there were enough healthy prairie components that the voids left by the cedars were quickly filled. I’ll definitely have to get in here this winter and remove small cedars and Virginia Pines. It’s been five years since I last cut out the small evergreens. When the cedars become tall enough that they’re obviously noticeable above the late summer grass, it’s time to cut them. A delay of a few years will allow them to grow to the point where they are serious competitors for the neighboring vegetation. A few more years of growth also makes it’s a major job to cut and drag the larger trees out of the field. This area is the only shale based opening that supports a population of Bluehearts. I’ve never seen more than a dozen plants blooming at this spot, but their presence allows me to compare growth patterns between populations growing in very different soil conditions. I planted these Austrian Pines as seedlings in 1986. I wasn’t sure where I wanted pines growing, so I planted them everywhere I thought they might fit. I figured I could always cut them down later if I changed my mind. This was all done before I knew anything about managing native ecosystems. I ended up removing a lot of the pines I had originally planted, but I left a few here. This was a site of very active erosion. The Austrian Pines were doing a wonderful job of stabilizing the soil, so they were left to grow. They may be removed at some time in the future, but Blue Jay Barrens has more urgent management needs than removal of inoffensive plants just because they’re non-native. There are still several places of almost bare ground, but there’s no longer any active erosion. 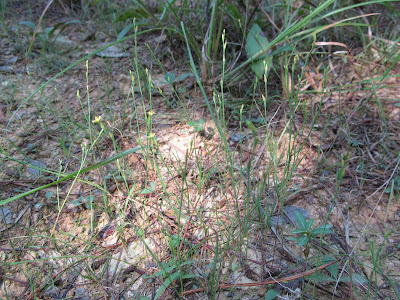 The bare spots now serve as a habitat for specialized plants that don’t compete well against aggressive neighbors. One of those bare soil loving plants is the tiny Orange Grass, Hypericum gentianoides. Also know as Pineweed, this plant grows in the bare soil beneath the pine trees. It’s a plant of acid soils and this is the only place I’ve seen it at Blue Jay Barrens. Orange Grass grows as a stem with no obvious leaves. Its common name comes from the fact that the plant turns a bright reddish-orange color in the fall. Maintaining some bare ground in which this plant can grow is just one item on my list of management objectives. 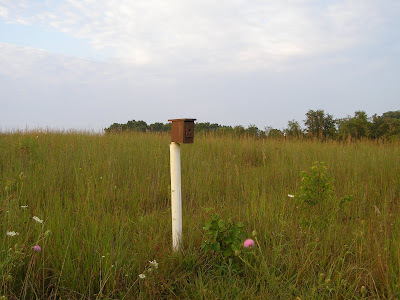 This is a good time of year to visit areas to assess management success and future needs. I’m in year one of my five year management plan renewal, so I’m identifying activities that should be accomplished within the next few years, as well as those things that urgently need to be completed during the coming winter. This field is roughly four acres in size. It was last cropped around 1976 and was being used for hay when we bought the property. Bedrock is shale and the pH is low throughout the entire soil profile. It has an amazing amount of diversity for such a small field. Wet conditions at the low side of the field transition to super dry conditions as you travel up the slope toward the high ground. Encroaching woody growth was cut out of this field two years ago. This Tuliptree probably got missed when I was marking the cut trees for herbicide treatment. Multiple sprouts have created a thick bush in place of the single trunked tree. This definitely needs to be cut this winter. The majority of trees in the field are ones that I have purposely left in place. These are White Flowering Dogwoods. Disease eliminated the dogwoods from their rightful place in the woodland understory. In order to keep White Flowering Dogwoods on the property, I’ve allowed them to stay in the fields. They’re spaced far enough apart that they don’t hinder growth of the prairie species. The township road boarders the long side of the field and makes this a likely place to discover non-native invasive species. I found just a few Johnson Grass plants near the fence. These must have been too small for me to notice when I did my normal Johnson Grass search earlier in the year. Since they would have been difficult to spray without killing everything around them, I just pulled them up. I’ll check this spot more closely next year to see if I can catch the plants when they’re smaller. From the looks of the roots, these are probably young plants that came up from seed this year. That’s why they weren’t noticeable earlier. 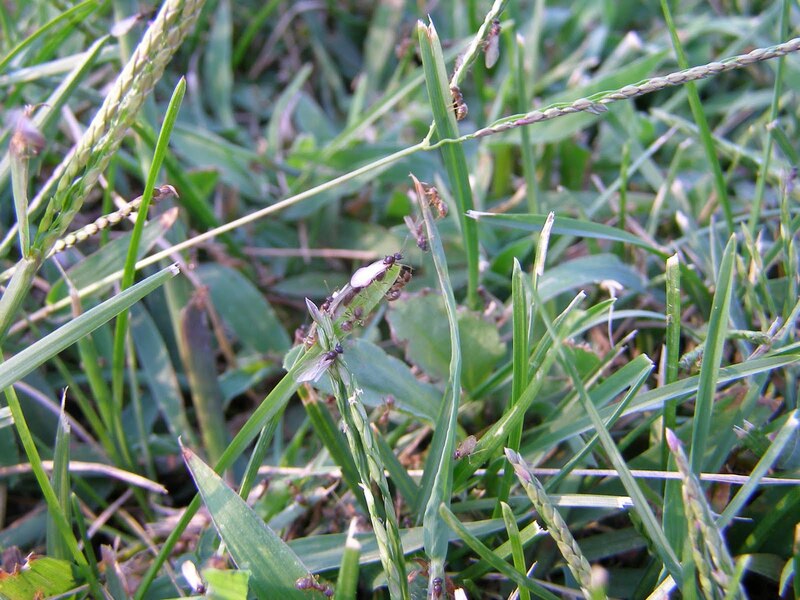 Johnson Grass spreads by way of rhizomes, so it’s hard to control the plant by pulling. Any bit of rhizome left in the soil produces a new plant. Most of the plants I pulled had not yet begun to form rhizomes and showed no signs of having arisen from an established rhizome. 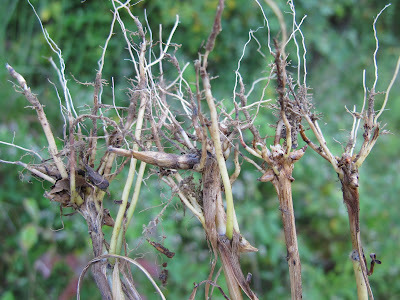 The plant second from the left shows some rhizome development and had a break showing that it had left something beneath the surface. Pulling may not have eliminated the infestation, but it certainly thinned it out. 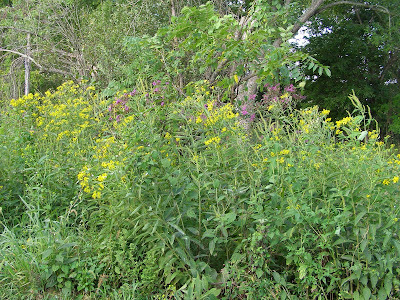 If you can’t kill an invasive plant outright, the next best thing to do is cause it severe stress. The Dwarf Sumacs are bowed under the weight of some tremendously successful seed heads. One more growing season and they’ll reach the stage where they must be cut back to the ground. 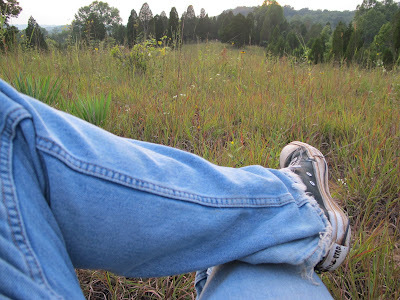 There are three large Virginia Pines in this field. Their shade does suppress some prairie growth around the base of the trunk, but they add a bit of diversity that is worth the loss of a few sun loving plants. They’re really turning into some lovely trees. Several of the Butterflyweeds are blooming here. 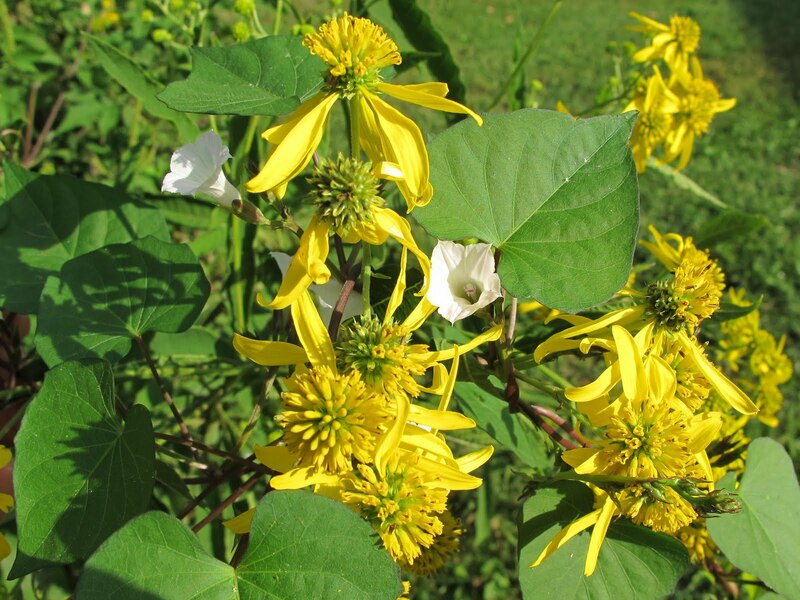 Unfortunately, there are virtually no swallowtails or other large butterflies to take advantage of the flowers. This has been a dismal year for large butterflies. 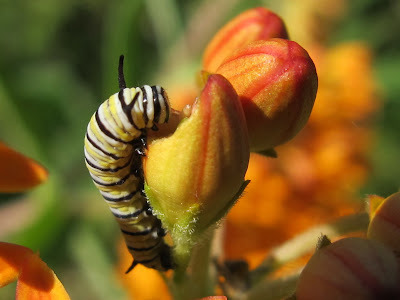 This caterpillar is evidence that a Monarch butterfly did come by. I’ve seen scattered Monarchs, but I think they all moved north as quickly as possible. The reports from farther north indicate an abundance of Monarchs up there. I’m looking forward to a very impressive southern migration this fall. 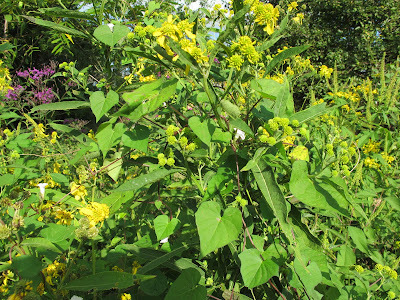 Wild Senna is scattered across the field. All were developing an impressive set of seed pods. It’s amazing how quickly this plant has spread during the past few years. 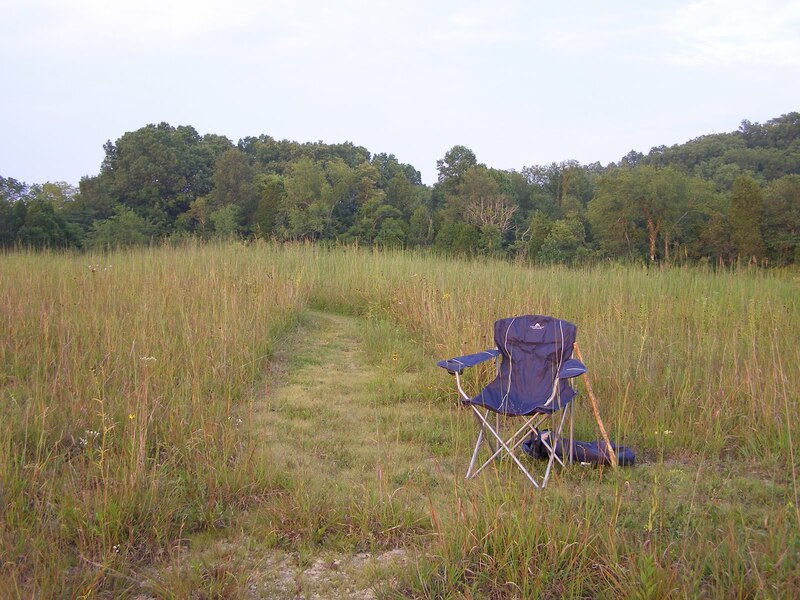 The bulk of the field is open and developing into a fine prairie. 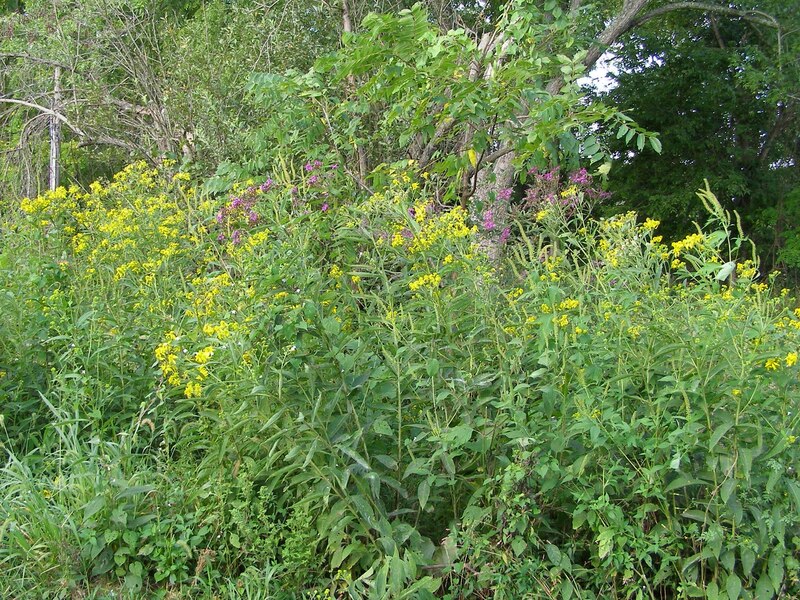 There are a few woody plants that need to be removed and a minor need for some invasive plant control, but there are no big problems to deal with. In a few years, this field should need nothing more than occasional maintenance. Over the weekend, I was able to add Number 527 to my list of plant species found growing at Blue Jay Barrens. This latest addition to the list is Small White Morning Glory, Ipomoea lacunosa, a native plant that reaches the northern limits of its range in Southern Ohio. I noticed this new plant when I saw the vines wrapped around the tall stalk of a Wingstem. At first I thought I was looking at one of the common weedy vines and then I got close enough to notice the small flowers. It’s always exciting to find a new native plant on the property. 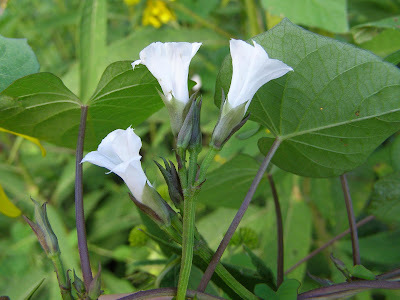 The flowers and leaves of the morning glory really complement the Wingstem display. I was happy to find this plant growing in a mix of other native species. 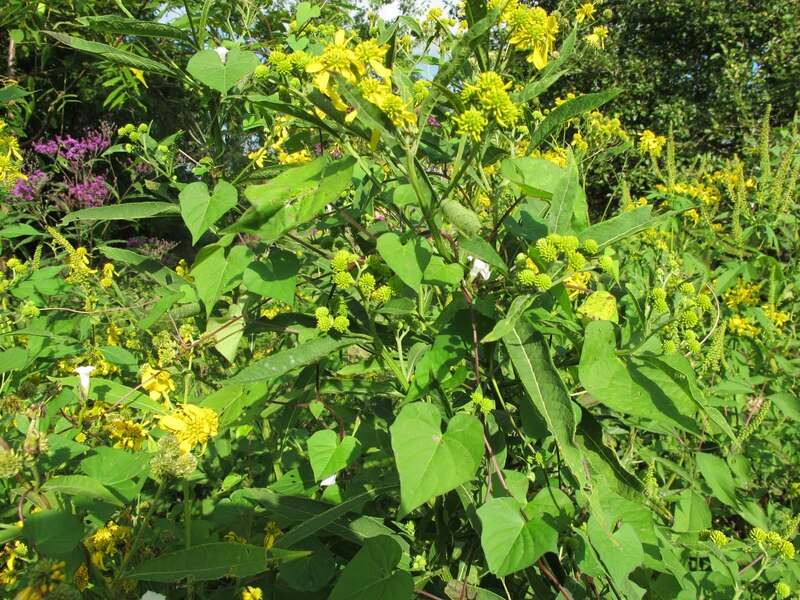 Some texts describe this plant as growing in weedy situations. It’s nice to see that it will do well in what I consider to be a non-weedy condition. 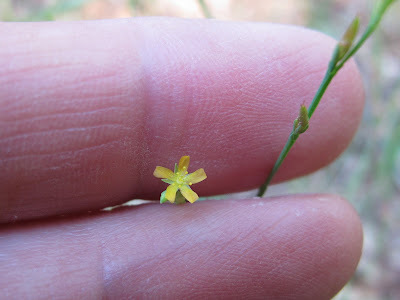 The flowers are on short stalks that come off of the main stem. There were anywhere from one to four flowers per stalk. 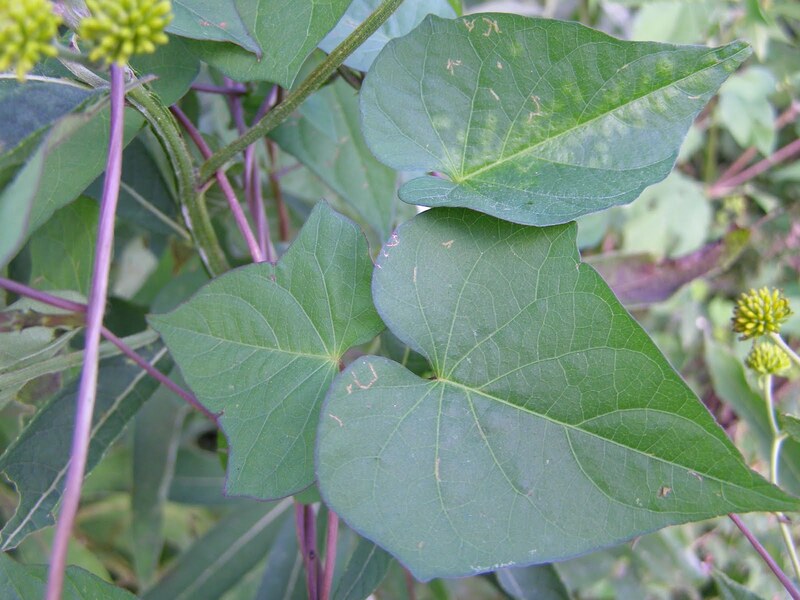 Leaf shape ranges from heart shaped to a three lobed form. Leaves found lower on the vine were all perfectly heart shaped with no indications of potential lobes. Those found higher on the plant were much more varied. There were already many fruits developing on the vines. 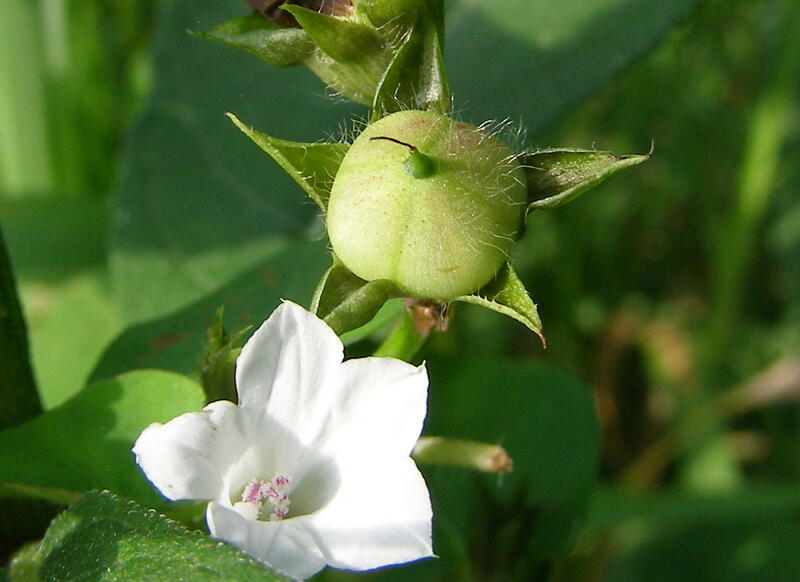 This is an annual plant, so a good seed crop is important to the plant’s continued survival on this site. It’s always fun to find a new species growing at Blue Jay Barrens, especially when it’s a native. Being able to identify the new plant makes it that much better. 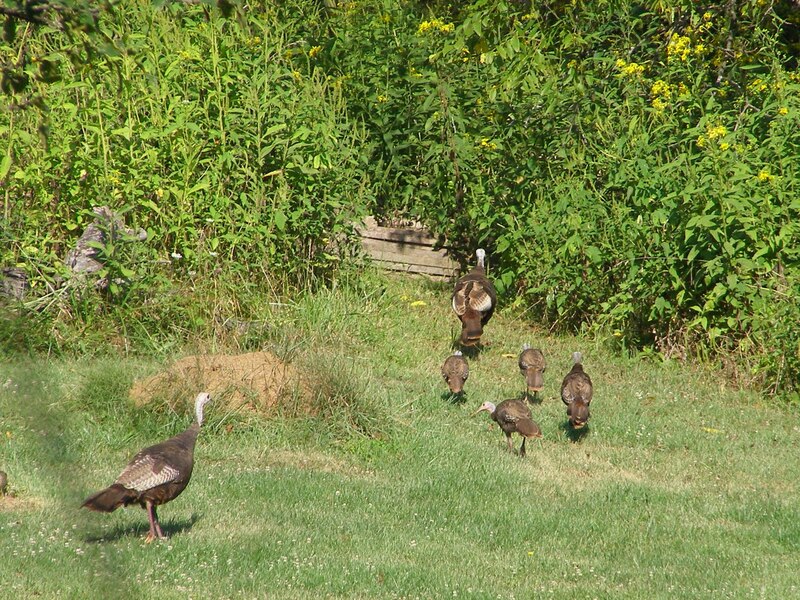 These are the same two Wild Turkey hens that I showed four weeks ago. 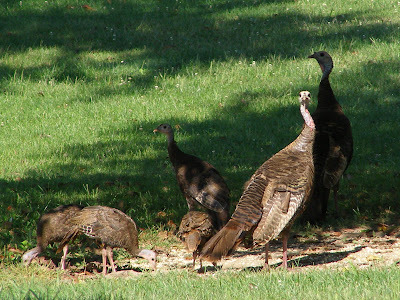 At that time, there were ten young birds, three larger and seven smaller. Now there are only four youngsters. 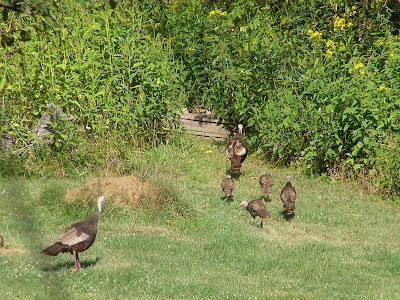 It’s possible that they joined another brood and are now following a different hen, but it’s more likely that they were lost to predators or the weather. Three of the smaller and one of the larger poults have survived. At this age they are more interested in eating the cracked corn. They can clean up a lot of corn in a hurry. Looks like I’ve been spotted. 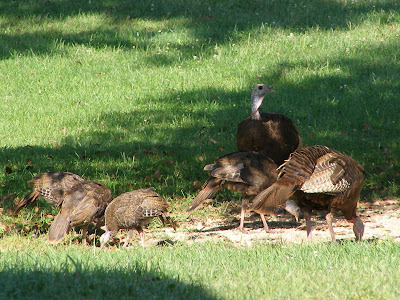 I was beside the house when the turkeys came into the yard, so I just leaned up against the wall and held still. They were so anxious to begin eating corn that they didn’t notice as I slipped my camera from its holster and powered up. Now that they’ve had a good meal, they’re beginning to wonder what I am. The youngest three still don’t know anything’s going on. I wasn’t scary enough to make them run away, but they did move out and head back toward the field. It’s actually a good thing that so few of the poults make it to adulthood. Having the flock size increase by three or four times would really have a devastating effect on the landscape. The Prairie Garden is beginning to look a little bit raggedy. The tall plants can’t contain themselves within the confines of the garden and are spilling out into the yard. Trying to maintain an abrupt transition from tall prairie to mowed yard is impossible. The tall plants at the interface between wilderness and civilization can’t help extending beyond their intended bounds. Western Sunflower has amassed an unwieldy collection of blooms. The Thursday morning storm wove the tall flower stalks into an inseparable mat. Many of the stalks are still reorienting the flowers into an upright position. They may no longer stand tall and proud, but their ability to produce seeds has not been diminished. Indiangrass is at full flower and has formed a screen that effectively hides many parts of the garden. 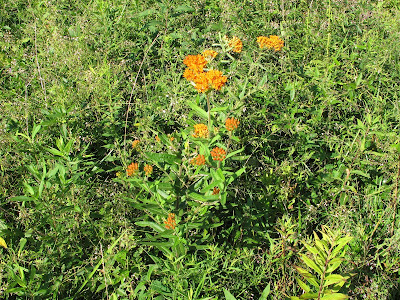 This Butterflyweed has produced a fresh batch of flowers. At the bottom of the photo you can see seed pods produced from an earlier batch of blooms. I wonder if the rainy weather is responsible for this second blooming season. The Baptisia seed pods are almost ripe. In another month, the pod covering will lose much of its shine and the seeds will come lose and rattle in the pods. There will be no shortage of Baptisia seeds this year. A fungus typically destroys about ten percent of the seeds, but the rest will be just fine. Despite floods, heat and drought, the Nodding Wild Onions have managed to produce some seed. I’ll be planting these in a special bed with hopes of having many new plants next year. Gray-headed Coneflower rushed rapidly through its blooming period and quickly produced seed. It’s been many years since this species has had such a short blooming season. For some reason, the Red Footed Robber Flies have declared the Prairie Garden a prime hunting ground. Dozens of these big predatory flies were perched around the perimeter of the garden. 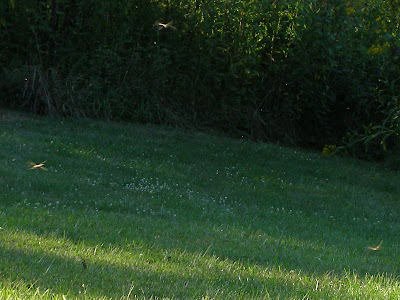 There was a constant drone of robber flies changing positions and darting out to capture insects flying across the lawn. After the initial disturbance from my approach to the garden, the robber flies settled down and behaved as though I wasn’t there. They put on a very interesting show. I call these almost UFO’s because I know what they are and some people could probably figure it out from the photo. The yard was aswarm with dragonflies grabbing ascending winged ants rising from the lawn and I was futilely trying to capture the event. Even if I did get a clear image, it’s impossible to capture the beauty of a dragonfly swarm glittering in the setting sun. The dragonflies were quick to take advantage of the ant exodus. 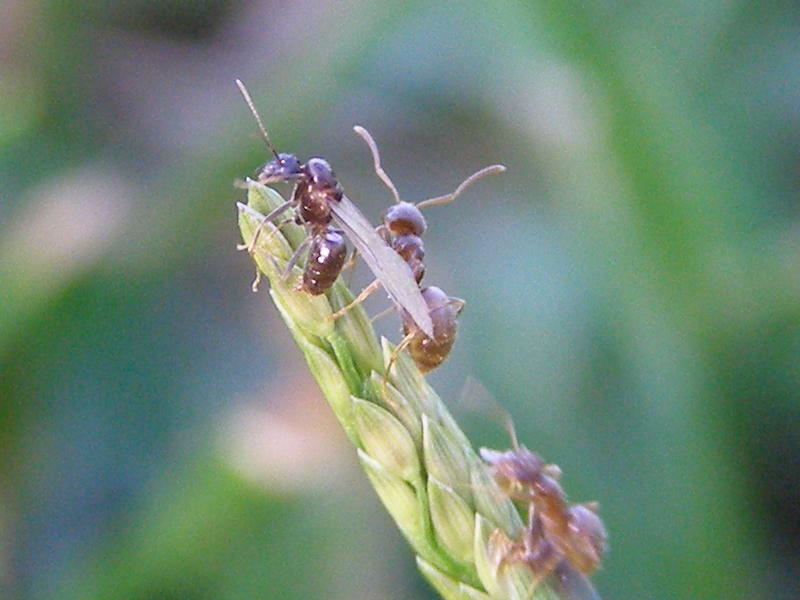 The departure of reproductive individuals from an ant colony is a short duration event. More ants in the air means fewer total victims of predation. 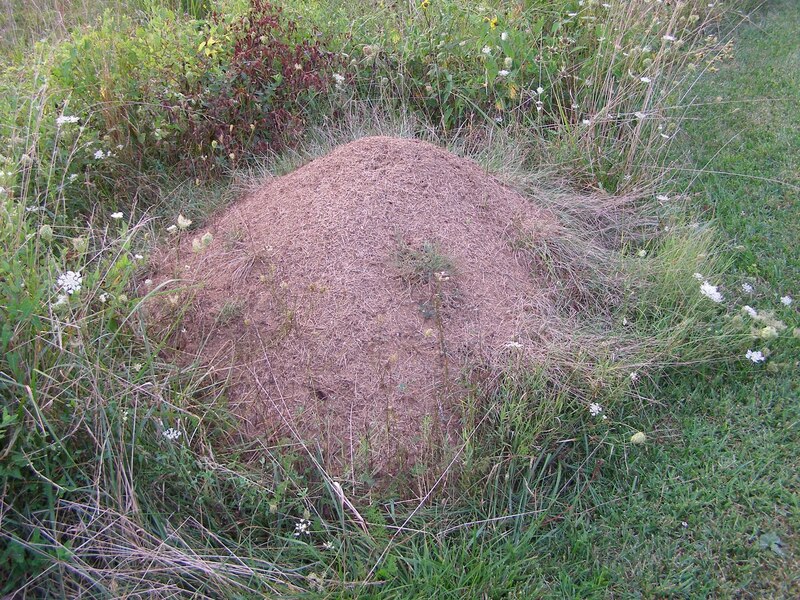 The timing also makes it less likely that predators will be able to accumulate in large numbers quickly enough to be a major threat to the ants. 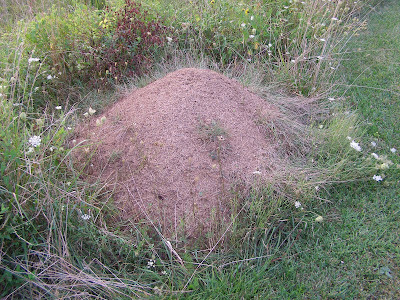 I observed both queen ants and the smaller males heading into the air. From what I could see, the dragonflies targeted the queens. Queen ants must be packed with nutrients because I’ve never seen a predator pass up a queen. The dragonflies all appeared to be Common Green Darners. 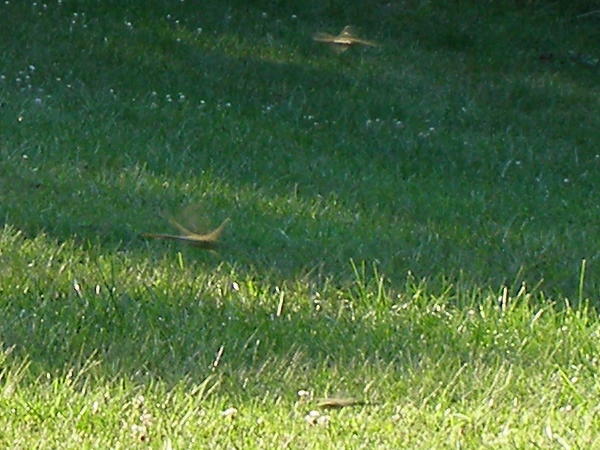 As the days shorten, dragonfly swarms will become increasingly common. This was a small swarm of around a dozen individuals. I’ve seen September swarms that contained hundreds of dragonflies. By the time I turned my attention to the ants, the queens had all departed. The males were still launching at a fairly steady rate. The males will catch up to the females and mate in the air. Other colonies of the same species are probably launching at the same time. As I watched, the workers and remaining males suddenly headed down the grass stalks and returned underground. There’s a good chance that they’ll be back at it tomorrow evening. I often tell people that living at a place as wonderful as Blue Jay Barrens provides me with an unusual problem. Where can I go on vacation that’s better than where I live? To answer that question, I’ve put together a series of typical travel shots depicting my latest vacation. No vacation series is complete without a beginning shot looking down the road you are about to travel. This is a narrow rural route, but I’m not worried about traffic. The maintenance crew isn’t doing a very good job of maintaining the road berm. I remember the road being much wider than this. I went past a few large cities. From the road, I could see construction in progress. The city expands a little bit each year to engulf more of the surrounding area. The road has to keep moving to stay out of its way. I enjoyed viewing the rural homesteads along the way. The homes were rustic, but well maintained. They seemed to be wonderful places to live and raise a family. This is where I stayed. The rather Spartan accommodations were well suited to my modest needs. It’s located rather close to the road, but I wasn’t bothered by traffic noise. I’d not had time to make reservations, so I was lucky to get such a prime location. Here I am relaxing. I actually sat here for half an hour without contemplating all of the work and management activities I could see needing done before me. That’s what made this a vacation. To be honest, I did think about removing those Yucca plants directly in front of me as well as thinning some of the cedars on the slope to the right, but that’s practically nothing compared to what normally runs through my mind. Here’s what I came to see. 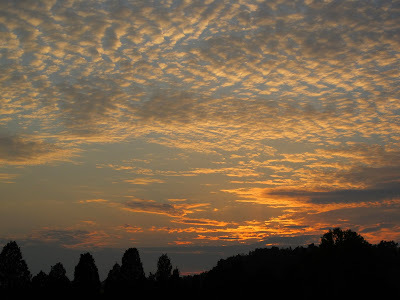 The always beautiful and never repeating patterns of the sunset never lose their appeal. Once the sky darkened, I headed home. Total duration of the vacation was 45 minutes, including the 10 minute round trip travel time. This is the kind of vacation that I really enjoy.